The new Simply Creative paper designs have been perfect for our Mother’s day makes and today is no exception! Read below how to create a fun and floral card that will definitely make your mum feel special on Sunday. 1.Take a piece of Dovecraft A4 cardstock and have it landscape on your surface. Score down the centre of the landscape side, and from your score line measure an extra 1.5cm, to make a strip. Cut off the excess card. 2.Take an A4 sheet of Dovecraft acetate and cut it down to 15cm x 21cm. Vertically, adhere your acetate to the back of the flap on the cardstock, to create the card front. 3.Cut a 1.5cm strip of backing paper to fit the front of the strip on your card stock, adhere to the card using glue. 4.Cut a piece of 15cm x 21cm backing paper from the Simply Creative paper pad to fit the inside of the card, adhere to the card. 5.We have used the Cricut Explore for the letters on this card and have chosen the ZOO DAY font in the Cricut alphabet section. Alternatively you can cut your letters free hand. 6.Cut three large M’s, 14cm high, 12cmwide at the bottom and 10cm wide at the top. Remember you need a mirror image to use for the back of the M.
7.Take the M you will use for the back and adhere a selection of foam pads to the centre of the M. Avoid sticking the foam pads near the edge of the M, as this will be where you stitch. Stick the M you have chosen for the front of your card on top of your first M. Ensure to align the two M’s carefully with the foam pads you have just added. 8.Carefully do a running stitch around the edge of your two M’s to hold them together . Add some strips of magnetic tape to the back of the M. Attach your finished Stitched M to the front of your acetate with two glue dots. Adhere the third M to the centre of the inside of your card. TIP Make sure that your stitched M aligns with the M inside your card. 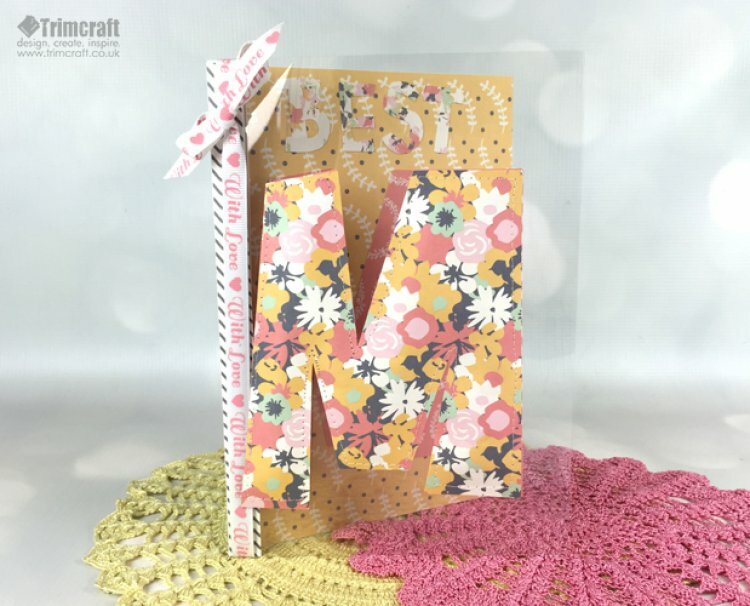 9.Use your Cricut Explore or First Edition Alphabet dies to cut out your letters to spell BEST and to add a U and M on the inside of your card. Adhere the word BEST to the inside of your card at the top and the UM to the bottom right corner to finish the word MUM. 10.Wrap a piece of ribbon around the card to make a bow to finish. Mixed media crafts are so much fun, who would have thought stitching, magnets, and papercraft would be such a great combination! What products do you like to mix when crafting? Don’t forget to upload your Mother’s day makes to the project gallery, it’s always so inspiring to see your newest projects!